When Cole Hamels arrived in the major leagues, he had a 90 mph fastball, decent command, and what would prove to be baseball’s best changeup. That’s a few bucks short of an ace, and so, in two of his first four seasons, he produced an ERA over four and maybe was looking for something. Now, instead of having one elite pitch, the Rangers’ ace is the only starting pitcher in baseball to possess four pitches in the top ten by whiff rates (minimum 200 thrown). That’s a long way from a pitch and a half. The fixes were simple, though, and he ran me through them before a recent game with the Athletics. 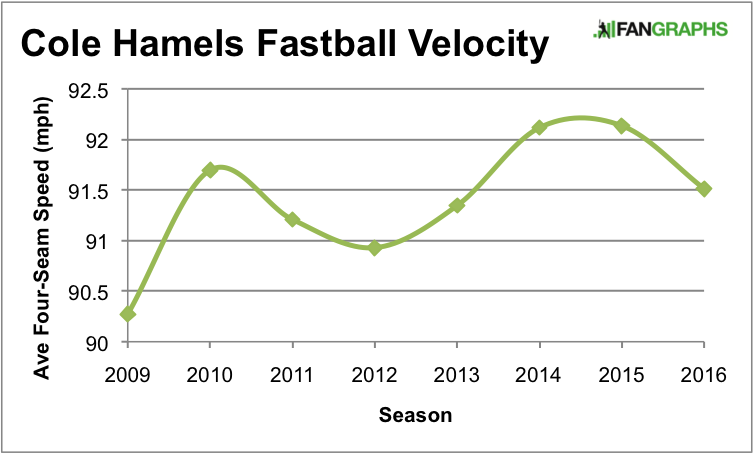 Here’s a graph that doesn’t follow normal aging curves: Hamels’ fastball velocity. Note that he was 26 years old in 2010. Instead of going down steadily, the curve has gone up. We could wonder why, but we don’t have to — Hamels can tell us himself. Turns out, Hamels had back problems when he came up — a herniated disc — and he finally was able to do something about it once he got a major-league contract. “I hired a chiropractor, and for the past few years, I have one that travels with me and works on me the day before the game and right after the game,” Hamels told me. Chiropractor to velocity increase is not a straight line. But feeling good did wonders for Hamels. “It frees me up, and it helps unlock me, and because of that I’ve been able to lift better. Before I couldn’t really lift. After pitching, I was just in pain. I couldn’t lift and grow into my body. I’ve gained more weight, I’m healthier, stronger, and I’m not in pain. I like being healthy every day, that’s been a game changer. The four-seam that gained two ticks, mid-career. Other than major-league money, there was major-league coaching waiting for Hamels when he got to the Phillies. But not from his pitching coach. In 2009, the Phillies had Cliff Lee for 12 starts, but that was long enough for the lefty to teach Hamels the pitch that changed his life for the better: the cutter. 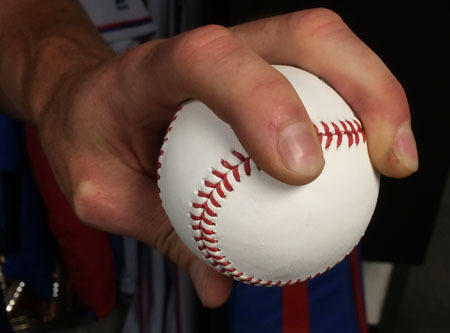 “It gave me another pitch that was a different speed, but I didn’t have to change up my arm slot or change up my motion, because the cutter is a fastball with a different grip that you just throw like a fastball as hard as you can,” Hamels said as he modeled the grip he learned from another legendary lefty. Cliff Lee’s cutter, on Cole Hamels. Long thought of as a lefty-killer, the cutter was important for a changeup-first lefty that was actually having a little trouble with same-handed batters. “It opened the door for getting guys off my changeup. Now I had a pitch that was moving in the opposite direction and changing speeds so they couldn’t slow down and look for the changeup,” Hamels said. 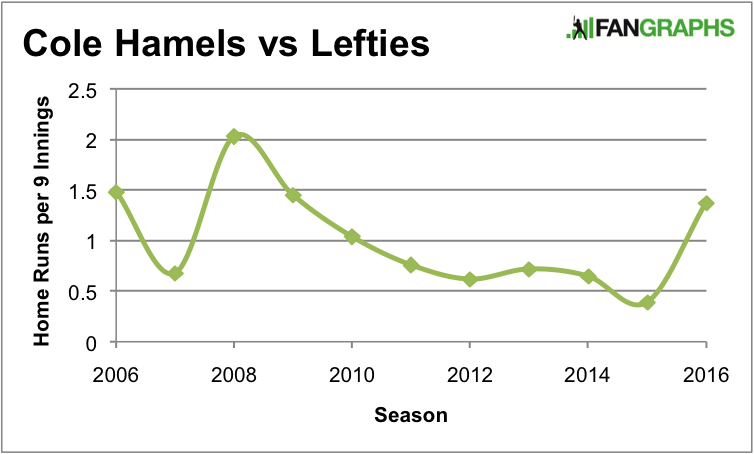 Keeping lefties from looking change helped Hamels fix a homer problem against lefties, and it really broadened his mix for batters of both hands. He also put himself in the 200-strikeout club for the first time, and started a string of years that established him as an ace. Hamels’ best year might have been 2014, though. And he had another great teammate to thank: A.J. Burnett. Though his actual work with the Phillies wasn’t super, Burnett made an impact when he taught Hamels how to through his vaunted knuckle curve. “He taught it to me in spring training and stuck with it 100%,” remembered Hamels. 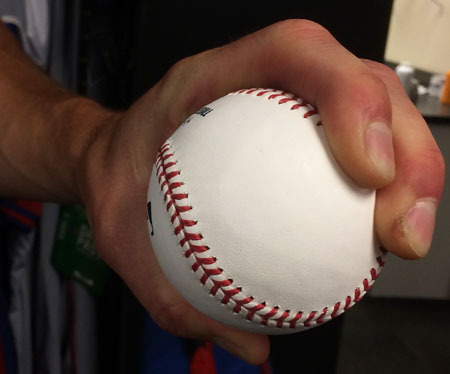 “Cliff was trying to push me towards that, too, but I didn’t quite trust it.” I told Hamels that Burnett had said to hold it like this and throw the bleep out of it, and the Rangers’ starter laughed. “That’s what A.J. told me.” He was glad to find another pitch that didn’t require him to change his mechanics or arm slot, another pitch he could throw like a fastball but would give him different movement. A.J. 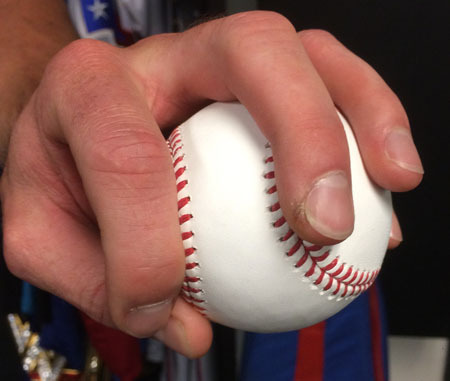 Burnett’s knuckle curve, on Cole Hamels. 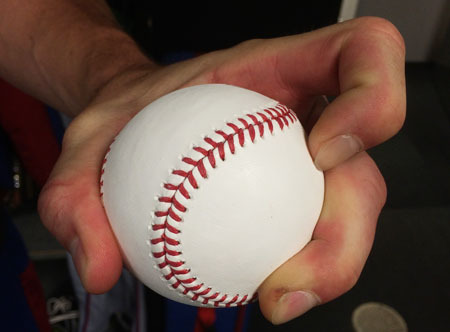 So why has this grip been such a big deal for Hamels? “I throw it harder and it has tighter spin. It’s definitely helped me out.” In terms of spin, it’s not a league leader, but it’s right there with the curves thrown by Steven Matz and Jason Hammel. It’s not among the curves with the biggest drop, or the most sweep. But research shows that curves do better with velocity — and Hamels has gained 2 mph on the curve, now throwing the 16th-fastest one among staring pitchers. It’s not surprising, then, that he’s recorded his three best years for whiff rate on the curve since he changed to the knuckle. It’s currently the ninth-best curve in baseball based on whiffs. This year, Hamels’ change is only fourth in baseball in whiffs, behind those thrown by Jeremy Hellickson, David Price, and Kyle Hendricks. But if you open it up and look over the PITCHf/x era, he easily has the best changeup in baseball. The Best Change in the Game. So why is he throwing it less? Why did he, as Corinne Landrey showed, not throw one to a lefty for five starts? “I didn’t face many lefties; that was the problem,” suggested Hamels at first. But he saw enough to throw 73 pitches to lefties! He agreed that some of it is luck, but thought also that he needs to re-learn the lessons of his early career. “I was being predictable, and they were slowing down enough to put solid wood on it,” he said of some of his home runs. So, going forward, he’s got the same issues he once had. “It’s a matter of figuring it out and trying not to be predictable,” as Hamels put it. The good news is that, thanks to big-league money, and big-league teammates that have taught him along the way, the lefty now has more velocity, a cutter, and a tighter, faster curve in his toolbox. 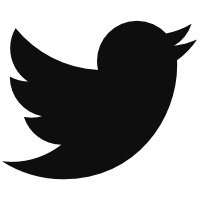 Oh yeah, and that change. That change. We hoped you liked reading Cole Hamels Got Better in the Big Leagues by Eno Sarris!